Have you ever been waiting for an important email and stuck filtering through your entire cluttered Inbox to check for it repeatedly until it arrives? With Ekaru cloud-based Exchange mail, you can set up a Text Message notification so you'll see when the important email arrives without needing to constantly check your Inbox. To access your settings, log into Webmail, and select "Options" on the upper right hand side of your home page, and then select "See All Options". On the left navigation, select "Phone" and then select the "Text Messaging" Button. From there, you can "Turn on Notifications". You'll be asked to enter your information for your carrier and your phone number, and will then need to authenticate. After notifications are turned on, you'll be able to set up "rules". 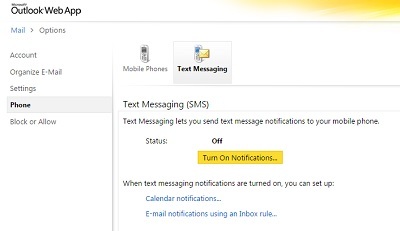 To set up notification "rules", click on the link that says "E-Mail notifications using an Inbox Rule". There are many different types of rules you can set up, but in this case, you'll select "It was received from...", and then select the email address you're interested in. 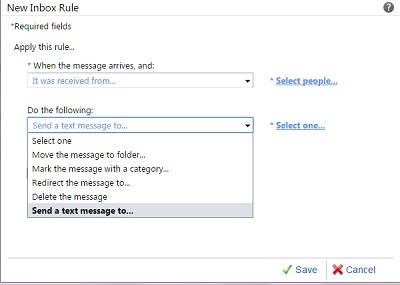 You'll then be able to apply the rule "Send a text message to..."
If you are waiting for an important email, or perhaps receive some critical business notifications during the day, this is a way to help organize and cut through the clutter of your Inbox. Wiring Closet / Network Gear: Are you a Felix or an Oscar? Does your wiring closet look like a neatly organized space or a tangled web of wires and black boxes? Your wiring closet is where your Internet and phone connections enter your office, and this is the heart of your network infrastructure. How the area looks isn't about cosmetics, but rather, critical for network up time. Here's a photo of a network we recently worked on for a small office. The changes we made were relatively minor, but have a tremendous impact on the ability to rapidly troubleshoot and remediate network issues. Network gear is placed on shelving or a rack so nothing is stacked on top of anything. Over time, equipment gets swapped out, Internet providers are changed, and office staff size changes. It's natural that over time, the wiring closet gets a bit chaotic (just like your clothes closet at home). In addition, workers may start storing other equipment in the room. As a "best practice", we recommend at least a yearly clean up to keep things in order. When a problem occurs, the time savings to quickly diagnose and remediate an issue is critical. In many cases, we can recommend quick self-help over the phone to power cycle a router or switch that can often mean your network will be back up in minutes. When things are organized and labeled, the guess work is removed. Keep the area neat and organized, and swap out old equipment. If you spot any network gear that's five years old, its time to replace it BEFORE it fails. It's that time of year - time for planning. You may have already completed your yearly plan in the Fall, but if you're like many small businesses, you're wearing many hats and even though January has passed, it's still planning season. As techies, when we hear the word "technology", we start thinking immediately about routers, switches, servers, operating systems, VPNs and all the different things we work with each day. 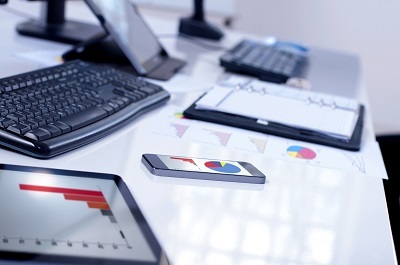 To form a technology PLAN for your business, the important place to start is to think about your business, and then see how technology can help move you forward with your goals. Here are the top seven questions we recommend exploring as you put together your technology plan for the year. What was your biggest business accomplishment in the past year? What is your top goal for the next year? If your business was at its absolute best, what would be different? What are the top three things getting in your way with respect to technology? What are people grumbling about in the hallway? What is your biggest drain on productivity/profit right now? What are some things you've seen other business do that you wish you could do? What is the biggest change you see on the horizon for your industry? To get the most from technology, it's important to think about technology as a strategic tool to meet your goals and move beyond the mindset of technology as a necessary evil involving replacing things with newer things, or repairing what's broken. Start with what you want for your business in the next year, and then see what role technology can play.